Pullela Gopichand, coach of India's first silver medal winning female athlete, PV Sindhu, has spoken out in favour of having a comprehensive training structure in place for the coaches of India's Olympic athletes, saying bad coaches can produce results even when they don't have anything else going in their favour. "Recognition to coaches is very important. I think they should be educated and rewarded; they require motivation just like players do. And just like players, coaches too should be identified and nurtured. Great infrastructure will not give you results if there is a bad coach, but a good coach can give results even with bad infrastructure," he said. Gopichand was speaking in Mumbai on Tuesday evening, at an event organised to felicitate him and his ward Sindhu. The two were feted by the the Maharashtra Badminton Association (MBA). Maharashtra chief minister Devendra Fadnavis and state sports minister Vinod Tawde were also present at the occasion, and presented Sindhu and Gopichand with cash prizes of Rs 75 lakh and Rs 25 lakh respectively. Those present at the event also lamented about the sorry state of badminton in the state, and efforts that are being taken to improve the situation. MBA president Arun Lakhani rued the insufficient budget for the maintenance of sports complexes in Maharashtra. He said that his association didn't need monetary help, rather assistance in entrusting sports facilities with people or associations who are passionate about the sport. He also requested the CM's help to build a world class badminton academy in the state. "In Maharashtra, we fortunately have large sports complexes in many districts. Unfortunately, however, the budget isn't enough for the maintenance of these facilities. Many lie neglected, or in a dilapidated condition, being used only partially," he said. "We recently launched player-friendly softwares and calendar planning for tournaments; we already have over 4,000 players registered with us, and we expect it to go to 10,000 by year end." "We need to connect these dots and come together for the sport. But I can assure you that within two years, we can see a fresh new beginning and players blossoming out of these facilities,” he added. Fadnavis seconded these thoughts. "In a state like Maharashtra, we have created a lot of infrastructure; there’s no dearth of infrastructure. It is now about managing that infrastructure," he said. Fadnavis also promised to bring about a change in the way things are managed in Maharashtra. "We would frame policies involving the respective sports associations, to ensure maintenance of our facilities," he said. But at the same time, the BJP leader said that politics and sports should be kept separate. "We need sporting spirit in politics, but we don't need politics in sports. We need to eliminate politics from sports, although the Supreme Court has said they will eliminate politicians from sports," he added. However, chief national coach of the Indian badminton team Gopichand, who was felicitated at the same venue after winning the All England Open way back in 2001, called for "physical literacy" in India. "I remember, about year and a half ago, I threw a shuttle to a kid, who was about 13, who missed the shuttle and got back and asked me. I was a little irritated, and said, 'catch it'. 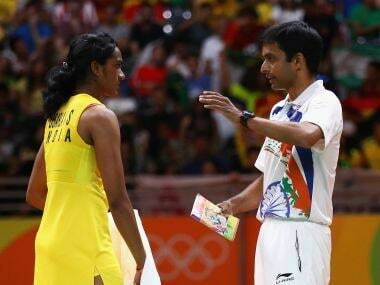 And she came back and asked me, 'Sir, show me how to catch'," Gopichand recalled. "If we need our country’s happiness index to go up, sport is fundamental. I think it's time our education system needs to re-look at things, it's time we put physical literacy up there," he added. PV Sindhu was in complete agreement with these thoughts. She thanked her parents and coach for their constant support throughout her career, and said she will be more focused. "I would just like to say I am really thankful to have a coach like Gopichand. It's because of him that I am here today, because of his hard work and sacrifice. Also, my parents, because they let be begin training from a very young age (eight-years-old). Despite being volleyball players themselves, they didn't question my decision to pick badminton. It's because of their support and motivation that I am here today," she said. At the event on Tuesday, Olympic wrestling bronze medalist Sakshi Malik and her coach Ishwar Dahiya were also awarded Rs 50 lakh and Rs 25 lakh respectively by the state government. Lalita Babar, the Maharashtra-based track and field athlete, who appeared in the 3,000 metre steeplechase finals at the Rio Olympics, was also given Rs 75 lakh, and her coach too was given Rs 25 lakh. Fadnavis also declared cash rewards for all the athletes from the state who represented India at the Olympics. Kavita Raut (marathon), Dattu Bhokanal (rowing), Ayonika Paul (shooting), Prarthana Thombare (tennis),Devinder Walmiki (hockey) were awarded Rs 50 lakhs each for their efforts at Rio.